The Director of National Intelligence has denounced the leaks of highly classified documents that revealed the programs. 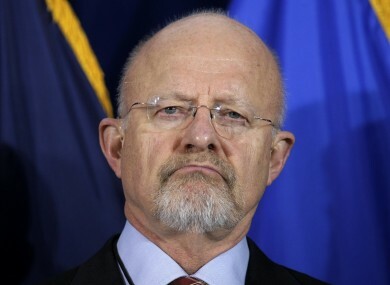 Under Secretary of Defense for Intelligence James Clapper. MOVING TO STAMP down a public uproar spurred by the disclosure of two secret surveillance programs, the nation’s top intelligence official is declassifying key details about one of the programs while insisting the efforts were legal, limited in scope and necessary to detect terrorist threats. Director of National Intelligence James Clapper, in an unusual late-night statement, denounced the leaks of highly classified documents that revealed the programs and warned that America’s security will suffer. He called the disclosure of a program that targets foreigners’ internet use “reprehensible,” and said the leak of another program that lets the government collect Americans’ phone records would affect how America’s enemies behave and make it harder to understand their intentions. His statement comes as The Guardian reveals that the National Security Agency had also obtained direct access to the systems of Google, Facebook, Apple and other US internet giants. At the same time, he offered new information about both programs, saying he wanted to correct the “misleading impression” created by out-of-context news articles even as he acknowledged that publicly discussing the programs comes with inherent security risks. Only 24 hours after the phone records program’s existence was first revealed publicly, Clapper took the rare step of declassifying and publicly releasing details about the authority used to authorize it, including that it’s reviewed by a special court every three months and that the data collected can only be culled when there’s reasonable suspicion — backed by facts — that the information is connected to a foreign terrorist group. The Obama administration’s defense of the two programs came as members of Congress were vowing to change a program they voted to authorize and exasperated civil liberties advocates were crying foul, questioning how President Barack Obama, a former constitutional scholar who sought privacy protections as a US senator, could embrace policies with strong echoes of President George W. Bush, whose approach to national security he had vowed to leave behind. At issue were two National Security Agency programs that came to light late Wednesday and Thursday after highly classified documents were leaked to the media. A top-secret court order, first disclosed by the Guardian newspaper in Britain, requires the communications company Verizon to turn over on an “ongoing, daily basis” the records of all landline and mobile telephone calls of its customers, both within the US and between the US and other countries. Another secret program came to light when The Washington Post and The Guardian reported that the NSA and FBI can scour the nation’s main Internet companies, extracting audio, video, emails and other documents to help analysts track a person’s movements and contacts. Microsoft, Yahoo, Google, Facebook, PalTalk, AOL, Skype, YouTube and Apple were all included. Most denied giving the government direct access. Clapper alleged that articles about the internet program “contain numerous inaccuracies.” He did not specify what those inaccuracies might be. Senior administration officials defended the programs as critical tools and said the intelligence they yield is among the most valuable data the US collects. Clapper said the internet program, known as PRISM, can’t be used to intentionally target any Americans or anyone in the US He said a special court, Congress and the executive branch all oversee the program and that data accidentally collected about Americans is kept to a minimum. The phone records program, too, has been taken out of context, Clapper alleged. His defense was echoed hours earlier by leaders of Congress’ intelligence panels, who dismissed the furor over what they said was standard three-month renewal to a program that’s operated for seven years. Committee leaders also said the program recently helped thwart what would have been a significant domestic terrorist attack. The NSA must collect the phone data in broad swaths, Clapper said, because collecting it narrowly would make it harder to identify terrorism-related communications. The court prohibits the government from indiscriminately rummaging through the phone data without evidence of a terrorist group connection, he said. Email “Google, Facebook, Skype, YouTube also tapped by US government”. Feedback on “Google, Facebook, Skype, YouTube also tapped by US government”.